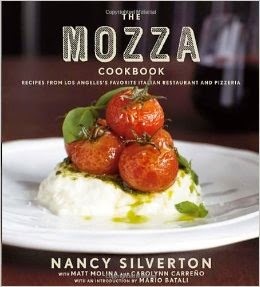 A traditional and delicious Italian meal is one of the most comforting meals everyone will enjoy so when I was gifted The Mozza Cookbook, filled with recipes from Los Angeles's hottest restaurant and pizzeria, I was ecstatic. 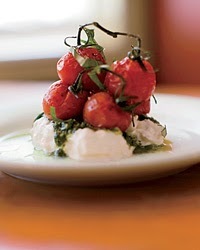 It's one of my favorite LA eateries and Chef Nancy Silverton makes the BEST Caprese salad with slow-roasted tomatoes. It's To.Die.For! Chef Nancy won the 2014 James Beard Foundation Outstanding Chef of the year, so I must say she knows what she is doing. Unfortunately, I was criticized by a fellow blogger on my slow-roasted tomatoes picture on Instagram advising me to remove the stems when I roast tomatoes as leaving the stems on impart a bitter flavor.... rubbish. So it's A-okay to leave the stems on. The Mozza cookbook is a freaking awesome cookbook for any home cook as it gives you Italian food knowledge which helps you become an accomplished Italian cuisine cook. It makes me want to roll up my sleeves and make every single recipe in the cookbook. To purchase cookbook, click here. Preheat oven to 300 degrees. Gently remove the tomatoes from container or from your farmers' market bag, making sure to keep the tomatoes attached to the stems. Brush the tomatoes with the olive oil and season with the salt and fresh ground pepper. Place the tomatoes on a baking sheet and transfer to the oven. Roast the tomatoes until their skin is shriveled but the tomatoes are still plump, about 1 1/2 hours. Remove the tomatoes from the oven and let them cool. Once at room temperature, I like to use these for a caprese salad or puree them to make a delicious pizza or pasta sauce. Better yet, top on a bruschetta or fett'unta! Enjoy! Thank you so much Mozza and Lindsay for the cookbook!